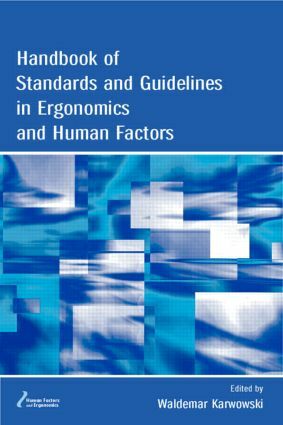 A comprehensive review of international and national standards and guidelines, this handbook consists of 32 chapters divided into nine sections that cover standardization efforts, anthropometry and working postures, designing manual material, human-computer interaction, occupational health and safety, legal protection, military human factor standards, and sources for human factors and ergonomics standards. The book delineates the role standards and guidelines play in facilitating the design and optimal working conditions in regards to occupational safety and health as well as system performance in the context of technological advances and opportunities for economic development worldwide. "This volume will evolve into a valuable and unique handbook for everyone designing and/or evaluating work systems. It does belong on the book shelf of all good technical libraries….it will provide most professionals with an invaluable and unique guide to better contemporary human factors evaluation and design." Design and Evaluation of Manual Material Handling Tasks.